We've been exploring polar regions in our preschool themes. Tyson has loved reading the books about polar animals, especially the polar bears. He even likes to tell me that he is a polar bear. When we read any of our favorite picture books about polar bears, he makes me rename the bear "Tyson". I thought it would be fun for him to create a polar bear mask. I also snuck in a little literacy learning by creating a poem about a baby polar bear. He really loved singing along to this poem with his polar bear mask. Today I am sharing the poem with all of you. I hope you can use it in your home or class. 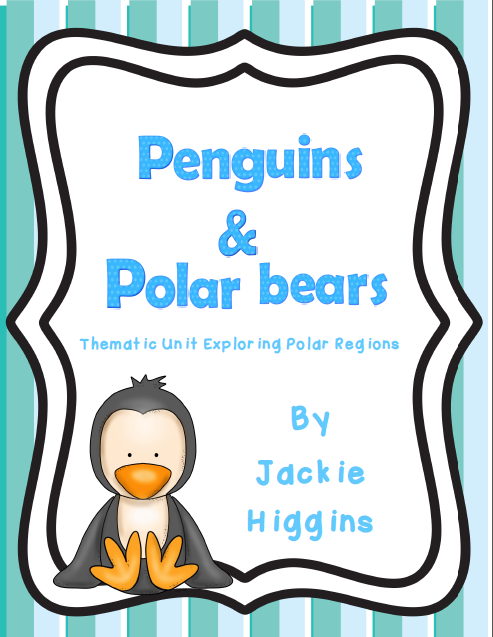 All this week I'll be sharing resources for creating your own complete penguins and polar bears thematic units. 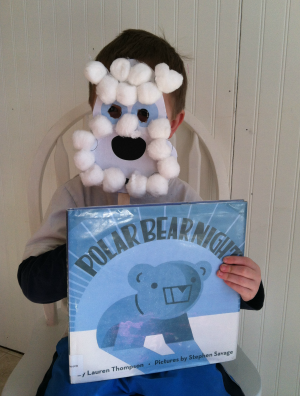 After reading Polar Bear Night by Lauren Thompson, we created a polar bear mask. You can find a printable of this mask in my Penguins and Polar Bears Unit. The mask in the unit has circles for children to match the cotton balls in one to one correspondence. Tyson loves the baby polar bears so I created this poem for shared reading. On snow that is bright. We are cuddled up close until day light. Model 1 to 1 correspondence in reading by pointing to each word as it is read. Use the poem to study early literacy concepts about print such as directionality, concept of a word/ letter. Ask students to state or locate the rhyming words in the poem. Have students locate known sight words in the poem. You can find a printable version of the poem in my penguins and polar bears unit. You can find it in my Teachers Pay Teachers Store or my Buy Sell Teach store.